All the comforts to let you enjoy your travelling/camping holiday. 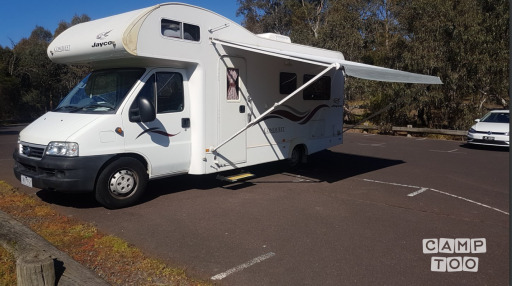 Easy to drive and very reliable motorhome. Plug into 240 volts for a site or 12 volts on the road. Electric and gas options. Plenty of light inside with opening roof hatches. All you need is a standard licence. As new condition travelled very low kms only. Standard licence is all you need. Current model layout. Two double beds, one at the rear and one in the cabin peak. The kitchen table converts into a smaller kids size double bed. Wind out telescopic awning. Plenty of wardrobe & cupboard space. Combined remote control TV/DVD with an update TV aerial. Radio. Complete ensuite. 3 way fridge. Gas stove and electric grill. 240 volt/12 volt hot water system. 240 volt microwave. Capsule coffee machine. Bluetooth speaker. External power outlet. Explore South West Victoria via the Bellarine Peninsula, the Surf Coast and the Great Ocean Road and take in the Grampians. Visit the wine regions of the state including the Yarra Valley, Mornington Peninsula, Gippsland, Goulburn Valley, Beechworth, Rutherglen, Heathcote, the Macedon Ranges and the autumn colours of Bright. Visit the Barossa Valley wine district of South Australia. Follow the Tour Down Under or take in the thoroughbred racing carnivals of Warrnambool or the Country Cups circuit in the spring. Mix the Melbourne Cup carnival with day trips to any of the wineries between race days. Holiday in the winter sun of Queensland for a couple of weeks. Please treat this as your own Motorhome.